Hierloom arikara sunflowers sprout into all sizes shapes and flower head counts (have not been hybridized into a uniform genetic profile that give mostly nearly identically flowers). Some are small, some have single blooms. some have mutliple blooms and some are just plain BIG. 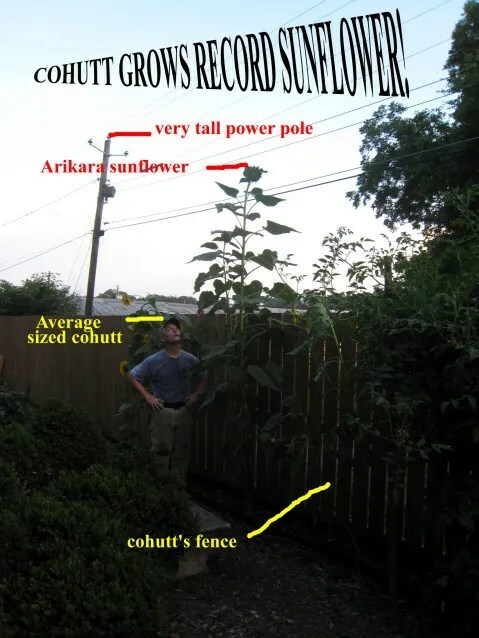 Average sized Cohutt? Cohutt’s must be really short. “Cohutt’s” is the possessive form and should not have been used in this context; instead, “cohutts”, the plural form, should have been used and hence would have demonstrated proper grammar. As I look at this exchange between you cohutt people, there are just way too many possibilities for smart comments. Way too easy, and since this is all on the public internet and subject to reading by your progeny, I will refrain from writing down such banter regarding cohutt’s and cohutts.